Journaling is one of the key habits for transformation. Your life is defined by the sum of your habits. Journaling regularly (I say journal daily) is one of the most powerful habits you should have. Although there is not a strict format you should follow, I like to say: if done correctly, consistently and intentionally, you will see transformations in every area of your life. The list of benefits for journaling is almost endless. Here are 10 of my most favorites. Journaling gives you more clarity, it clears so to speak the mind clutter. By just offloading what’s on your mind, you literary clear and sort your thoughts. Journaling helps you to stay connected with your values and goals. If you already have formulated your values and goals, then journaling can help you to stay more focused on them. Journaling gives you insight into your thought and behavior patterns. By tracking your thoughts and behaviors you create an excellent overview of what works for you and what doesn’t. Journaling will help you to unlock your creative potential. Journaling will focus you on output and not on input what most people do. Journaling is like a reset button for your emotions. By just letting off steam in your journal, you actually reset your emotions … Excellent for evening journaling and excellent to put your day in perspective. Journaling will stimulate, accelerate and enhance learning. Journaling will help you deepen any learning you have in a day, it will give you self-feedback and self-reflection all things that enhance learning. Journaling records your life. By daily journaling your create an incredible overview of your life. Reading back in your own journal reminds you of the directions you took, the choices you made and the experiences you have had. A treasure you will be happy to have created. If you are not journaling yet, buy yourself a nice journal (it is after all the recording of your life) and perhaps a special pen (yes I’m old fashion, I prefer to really write, it also proved to be more effective) and start journaling. 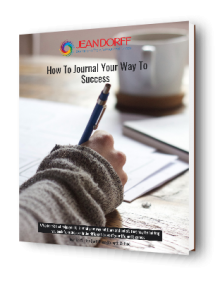 If you don’t know how to start I wrote a special workbook “Journal your way to success”. Contact me on info@dmcbcoaching.com.